We Insist! 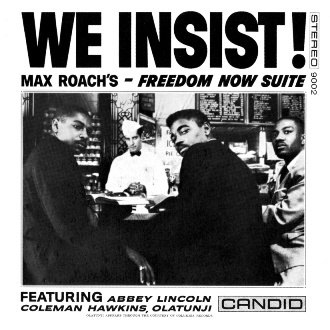 Max Roach’s Freedom Now Suite is a jazz album released on Candid Records in 1960. It contains a suite which Max Roach and lyricist Oscar Brown had begun to develop in 1959 with a view to its performance in 1963 on the centennial of the Emancipation Proclamation. The cover references the sit-in movement of the Civil Rights Movement. The Penguin Guide to Jazz has awarded the album one of its rare crown accolades, in addition to featuring it as part of its Core Collection. The music consists of five selections concerning the Emancipation Proclamation and the growing African independence movements of the 1950s. Only Roach and Lincoln perform on all five tracks, and one track features a guest cameo by one of the inventors of jazz saxophone playing, Coleman Hawkins.